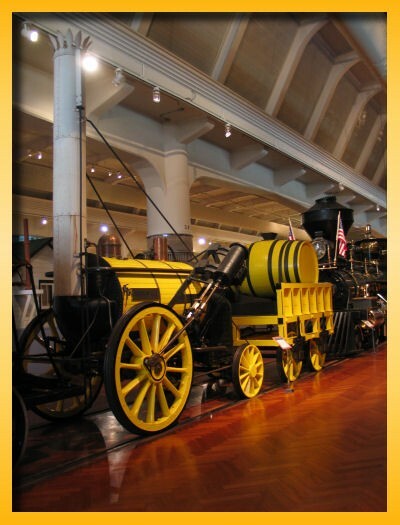 Built by Robert Stephenson and Company for Henry Ford in 1929, this is a fully operational replica of the original Stephenson’s Rocket (built from original designs). I thought it was pretty cool given that I own the game as well. Noah had some free time with mom and dad this afternoon while Sophie was away with a friend. He helped me pull out the 28 foot extension ladder so I could get up and clean out the gutters and by the time I got inside from mowing the yard he had a game picked out. He’d been wanting to learn Tikal and I thought he was old enough to grasp at least the mechanics with the strategy and tactics coming later. 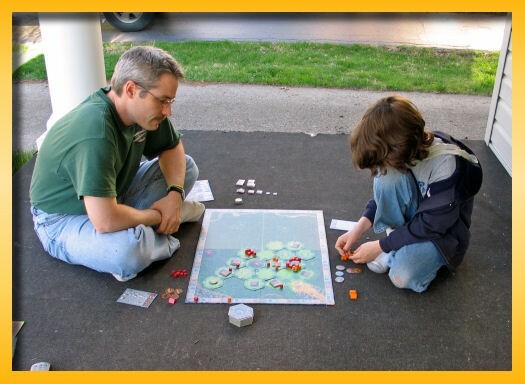 We started playing inside but after the first few turns we decided to finish outside on the front porch in the sunshine. As I suspected, Noah fully grasped the mechanics without any problem. He became fixated on one particular temple early in the game and he did everything to keep me from getting it. He abandoned much of his position on the board and ended up losing several of his men when he placed the guard on top of the temple. Doing so left him at a real disadvantage at being able to have enough explorers to teleport around through his base camps to attack other temples and to dig for treasure. All in all though, he did a great job. I really like playing outside and the artwork of Tikal looks twice as appealing in the late afternoon sunshine. I checked out Carolus Magnus from the CABS game cabinet last week allowing me to tick off another game from my list of wanna plays. I read through the rules last night and while Sophie was off at piano lessons, Noah and I poured out the contents and run through a quick game. The OCD in me wanted to check that all of the pieces were there and after sifting through the 200 cubes I found that there was one extra red cube but 1 blue and 1 purple cube missing!!! The horrors!!! We set out the initial 15 region tiles in a circle and then randomly populated them with a single cube taken from the initial set of 15 cubes (3 of each color – red, blue, purple, green, and yellow). Each of us took a set of the 5 turn-order ‘bidding’ chips and a set of 10 castles. We placed the yellow Emperor, rolled the dice to populate our initial 7 paladins (cubes) and began playing. The bidding is pretty simple since you place a chip in the center of the ring of tiles and your opponent must place a chip of a different number. The player with the smaller number goes first and selects 3 paladins from his reserve of 7 and chooses to place them in his court and/or out onto the tiles. 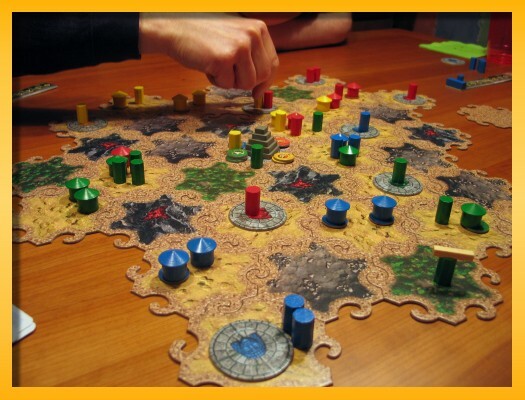 After placing cubes, the player moves the yellow Emperor clockwise from 1 to N tiles where N is the number on the bidding chip. When the Emperor stops, you determine who has the most influence on the tile and if it has no castle, the more powerful player places a castle. You can ‘attack’ and take over regions if you land on a tile with castles and if you have more influence at the time of the landing. When two adjacent regions are controlled by the same player, the regions are automatically coalesced into a single region containing multiple castles. The rules weren’t very clear on this rule and you can see in the upper right corner of the image that there are two adjacent regions with white castles that should have been merged. BGG has a few debates about the merges being required but after digging around a bit, there was a mention that Leo Colovini verified that it is mandatory. At the end of your turn you restock your reserve back up to 7 paladins by rolling the dice and selecting the colored cubes depicted (crowns are wild). Your court (bottom right in the image) allows you to line up cubes next to the colored dot and if you have the most cubes in the color, you capture the small cylinder declaring you the controller of that color. 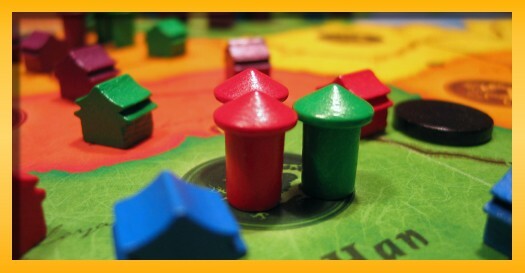 Being in control of a color is crucial when determining when castles can be placed and when regions can be taken over. 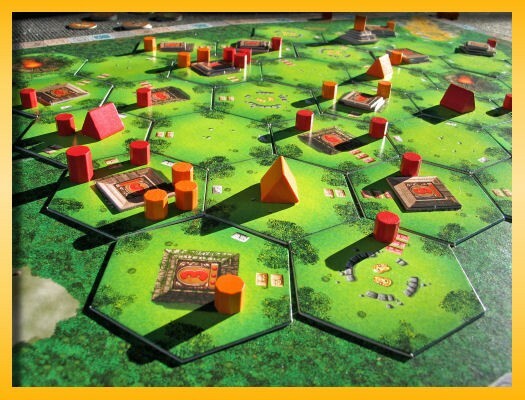 Strategy recommendations say to keep your court supplied with cubes early in the game and towards the end game you can start loading up tiles to gather support from the fields during hostile take overs. 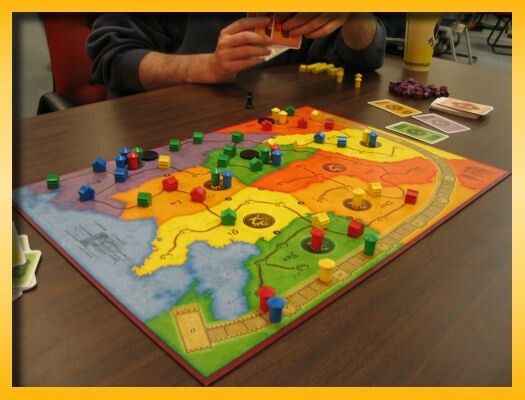 The winner is the first player to build all 10 castles or when there are 3 or less remaining regions (2-player game). In the case of the latter condition being met, it’s the player with the fewest castles left that wins. This was my first playing of the game but I really liked what I saw and felt. The play time is short (30-45 minutes) and it does strike a chord with my obsession with nice bits. I can feel the tension when determining how to bid given what your opponents have in their reserves and what chips they have left. Which cubes to select to play and where to play them also warms up the thinker…in a good way. Having to live with restocking from the dice roll is the only aspect of the game that has me a little worried. There may be variants out there to reduce the random aspects in this area but I might just play it a few times before I go digging for a solution to a problem that might not manifest itself for me. There wasn’t an overturned ammonia truck hampering attendees this week but there was some pretty severe weather and an active tornado watch in the area. I don’t attempt to keep track of the number of attendees but I would estimate that there were close to 100 throughout the evening. I arrived at 7:00pm to a pretty full house and I had to wait until about 7:30pm to get in on a game. 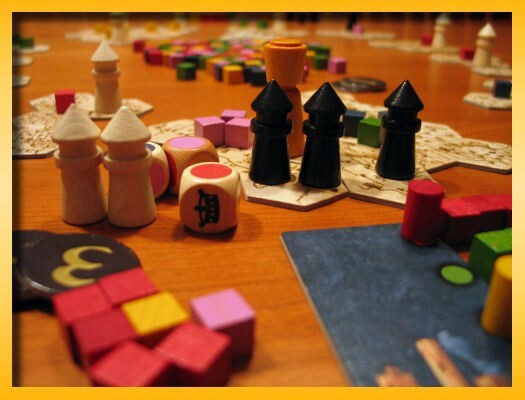 I packed a bag with China, Mesopotamia, Hansa, For Sale, and Samurai as a Plan B when/if we started standing around the game cabinet trying to figure out what to play. This meeting was very enjoyable and I didn’t get home until 4:30 this morning! First up was my copy of China designed by Michael Schacht for a 4-player game with one seasoned player, two new players, and myself with only one game under my belt. Due to the seating arrangements, the seasoned player was to my left and the new players weren’t taking advantage of emissary opportunities and/or they would trigger a opportunity that couldn’t be ignored. Because of this, I had to play a mostly emissary based strategy. Although I was last on the track for house scoring points I blew away the field by dominating the bottom half of the board for the emissary scoring. Although I can chalk it up as my inaugural win at CABS, to be honest, it was handed to me on a platter. 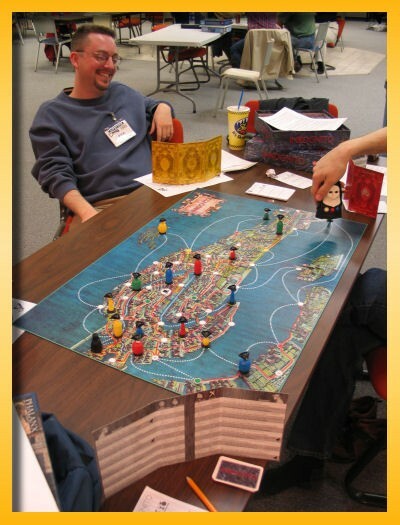 Next up was Alan’s copy of Inkognito designed by Alex Randolph and Leo Colovini in cahoots with Venice Connection. I’ve played Inkognito several times and I was up for the deductive challenge. 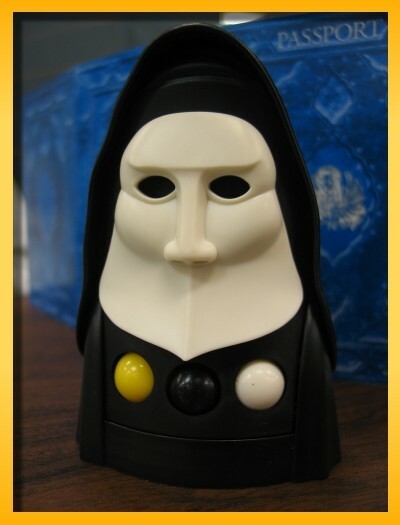 Nunzilla was particularly cruel with doling out the white balls but in the end I was able to declare the win by naming my partner and meeting my team’s mission goal. In the gap between games we lost a player to a better opportunity opening up at another table but we were able to pick up a replacement player and we sat down for a back to back playing of Inkognito. This time everyone knew the goals and their partners pretty early on but Nunzilla was not cooperating. At one point, a player told the following player (his partner), “you better not roll three whites”…and sure enough, he did. My partner and I both failed to roll a black ball to move the ambassador one silly space for the win, and finally the player to my left rolled what he needed to declare the win. One of the players had to leave but we picked up another player and pulled out Maharaja designed by Wolfgang Kramer and Michael Kiesling. I was a little concerned during the rules explanation because the new player was spending a fair amount of time convincing his girlfriend (a CABS observer) that he wouldn’t be long…it would be all right…we’ll leave right after I’m done. 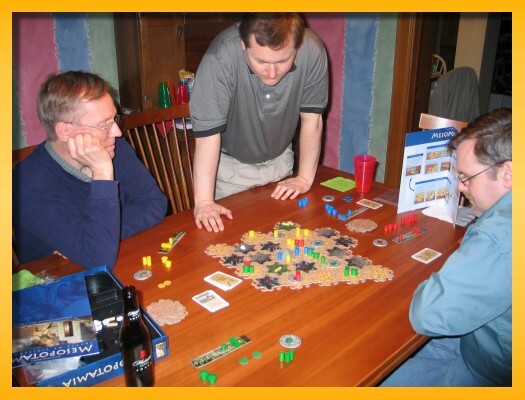 Leaving in the middle of a game is just a big gaming faux pas and I felt like we were right on the cusp. In the end, it worked out fine. Unfortunately, we handed one of the players the win by letting him hold onto the Role 1 card too long without jumping out ahead of the pack and going for a future city or choosing to manipulate the governor track. It was an oddly played game but still fun. Maharaja remains one of my favorites. Now…the gem of the evening: Nautilus designed by Brigitte and Wolfgang Ditt. From what I understand, Nautilus is the only game this husband and wife team have designed and wow, to come onto the scene with a game like this is incredible. 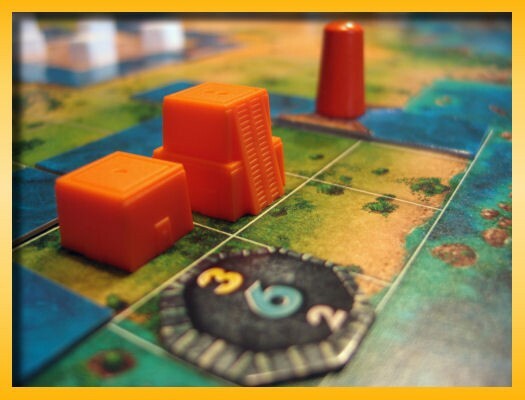 The game calls for players to build an underwater research station tasked with finding Atlantis. Players build habitation modules loaded with scientists, place research modules in various colors, move scientists around the station to activate the research modules, launch submarines into the deep, explore the trenches for treasure and signs of Atlantis. The game is classified as a Set Collection game but there is so much going on in the game that it seems a shame to stamp it as a Set Collection game. Money is so tight in the game that it has some of the same resource management aspects as something like Power Grid. Each player has their own score board/playing mat that due to its layout snookered me into playing it like you would Ingenious. You have several aspects to your play mat (green – scientist movement, gray – sub movement, brown – sonar strength, blue – super sonar, black – treasure value) and throughout the game you move a marker for each aspect forward increasing your ability in that area (e.g. increasing your ability to move through the station or increasing the distance your sonar can ‘see’). However, you get bonus points for that aspect if you are the most powerful player in that aspect. Being the most powerful is extremely important even at the expense of some other aspect which is very unlike Ingenious where you cannot ignore your lowest score. Scoring in Nautilus is easy to calculate but somewhat unique. Your play mat is divided into two sections. 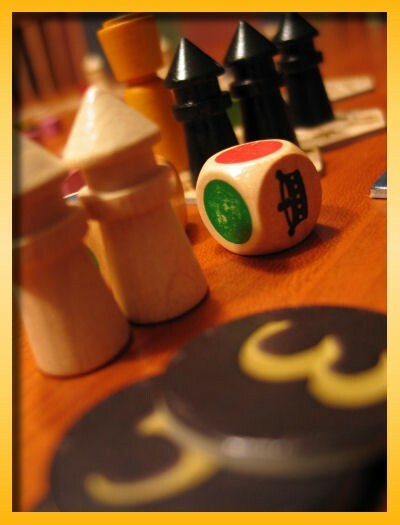 On one side is the ‘Ingenious’-like scoring track for the five aspects of play. On the other side, is the area where you place the treasures you’ve located with your sonar and subs. There is a special spot on that side as well that is filled in with a chit that numbers from 1-5 (see below). Your final score is the sum of your left side points multiplied by the sum of the points on the rights side of the mat. Now, where does this 1-5 chit come from. While your subs are out finding treasure, they can uncover pieces of Atlantis. These pieces are numbered from 1-15 and those pieces, when found are placed on a small board near the main board (the small colorful board just below center on the left side of the image) . 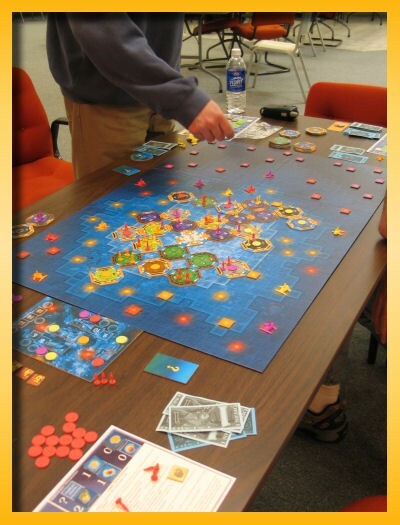 Players vie for having found the most number of pieces of Atlantis. Ties are broken by finding the piece with the largest value. At the end of the game, players grab the 1-5 chits based on how they faired in the Atlantis chip finding business. Nautilus is a fascinating game. The play time is longer than I would normally gravitate towards but I really like it. I think it took us almost 2.5 – 3 hours to play but I really didn’t notice it. There is very little downtime and it’s rarely so clear what to do that you can’t spend some time thinking about what to do next. The theme of Nautilus is very nicely integrated into the game (e.g. subs have a 3D movement component that allows them to ‘fly’ over the station). The integration of the trench depths into the cost of building a station is ingenious as is the use of octagonal tiles which force games to play very differently from one to the next. The various ways to score points keeps the mind humming trying to find the best approach to managing your money, your position on the play mat, your number of scientists free to move around the station, your position on the Atlantis board, and the position and strength of your three subs you’ve deployed. We had a very small group tonight. Gus was swamped at work and Mat and Tim couldn’t make it. Keith was busy building a set for a play with his kids so that left Paul, Ken, Rich, and me. It worked out pretty well though since I got a chance to play all three of my new games! We started out with For Sale designed by Stefan Dorra. I’ve recently reviewed the game and I’m still enamored by the simplicity of it yet the amount of angst that goes through your brain. It’s not heavy by any means but still feels like there’s more to it than say, 6-Nimmt, or God forbid, Fluxx. Unfortunately, my pictures pretty much sucked of us playing this game so I apologize for not having one. Card games are really hard to frame a useful shot. If anyone has any tips, please leave a comment. I’d appreciate it. 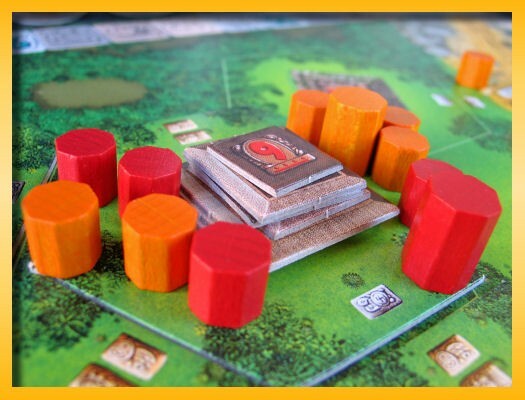 Next up was China designed by Michael Schacht (Coloretto, Hansa, Fist of Dragonstones, …). I really liked this quick area influence game. The game plays extremely fast and I really like the different scoring mechanisms. Using emissaries and their cross region alliances was a nice touch. The point allotments for the completed regions (house placement) seems a relatively rare form of scoring. I enjoyed the tension caused by wanting to keep building more houses to get more points for a continuous road but at the same time you don’t want to blow away your opponents in a region since that decreases the point spread between first and second. Ken found it hard to get past the fact that the map didn’t appear to resemble any China he’d ever visited. Having been to China for adoption reasons he should know. But, alas, we ignored him anyway and kept playing. 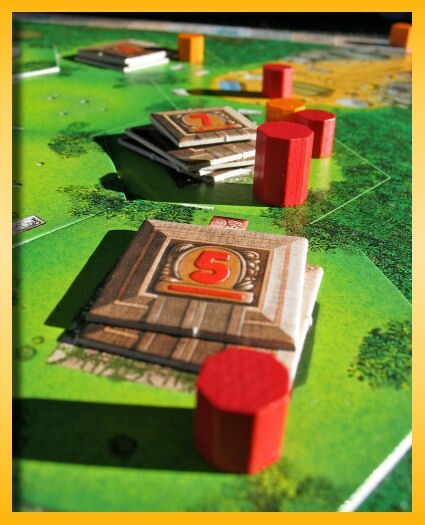 Next up was Mesopotamia designed by Klaus-Jürgen Wrede (Carcassonne). When I blogged about Amun Re I felt it was the most photogenic game I’d ever played but I may have found a contender for the title. 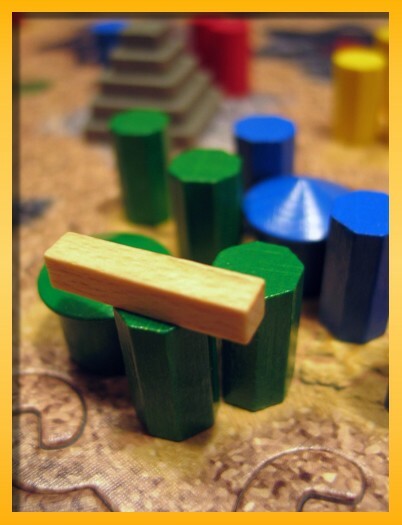 Mesopotamia is simply a gorgeous looking game with a good game inside too. Phalanx and Mayfair have produced a very nice looking and high quality product. The interlocking tiles are an excellent hedge against accidental table-quakes, the wooden bits are top notch, and the real rocks are just darn cool. The entire game was very enjoyable in that we all felt like everyone was in the running. I thought Ken didn’t have a chance but he ended up winning. However, had Ken not been able to win on his move, then I would have won. And the same went for Paul and Rich. There’s nothing more sweet than feeling like you needed just one more move to win…well besides winning that is. We did play with the correct rules that when you bring rock to the temple, the rocks go back in the supply. The written rules state that the rock should be taken out of the game. However, this was shown to be a translation error. It was not the intent of the designer to make rock such a highly prized commodity that it would dominate the strategy. There is a downside to the game though. At least in our playing, the game brought out the worst in us in that there are more innuendos in this game than even Settlers of Catan. Having ‘wood for sheep’ ain’t got nothin’ on this game. In Mesopotamia, you need two tribesmen with rock for a holy erection. Two tribesmen and a stick allows you to go ‘hut yourself’ but that’s okay because you can then give birth in that hut as long as two guys guard the door (and one of them wears the offering token as a hat). It goes on and on but I’ll leave it at that. It was a quite enjoyable evening even though it was a small crowd. Thanks guys for coming and see you next month. 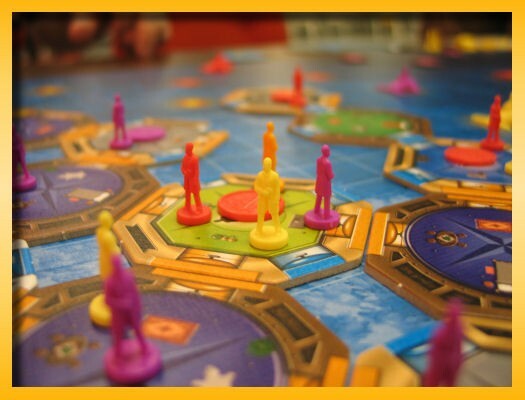 Lately the every day aspects of life have been putting a real crimp in my ability to play very many boardgames. Noah and I had a little bit of time last night and he wanted to learn Mexica. We managed to play half of the game before it got too late but I think he got a good feel for the game. Mexica is one of those games that I just don’t ‘get’. This article hits the nail on the head. At its roots, the game is just another exercise in area dominance but there’s something about it that really messes with my ability to play it well.